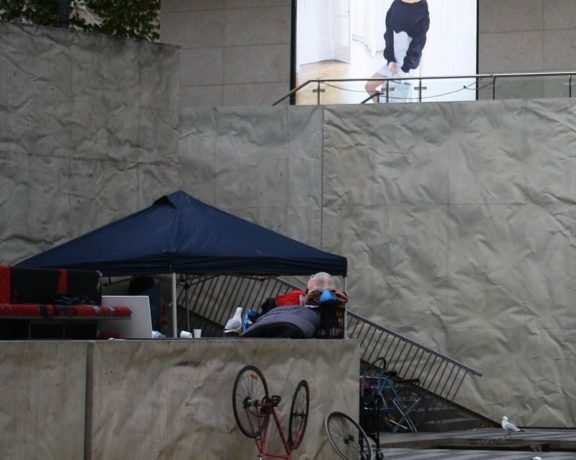 Melbourne Lord Mayor Robert Doyle has announced a plan to ban sleeping rough in the city. Doyle did so last week amid significant pressure from both Victoria Police and the tabloid media. When Victoria Police Chief Commissioner Graham Ashton called on the state government to extend police powers, Doyle at first seemed to reject the idea. But he later said he would propose a new bylaw to the city council. Ashton claimed that the people living on Flinders Street are not really homeless, a suggestion echoed by Herald Sun columnist Rita Panahi. They say new laws and powers are needed to “clean up the city”. Critics from the homelessness and community sectors argue this would effectively criminalise being homeless. However, what exactly does this mean? And how would this differ from current strategies for governing homelessness in Melbourne? My doctoral research, which examined how homelessness is regulated in Melbourne, found homelessness is already effectively criminalised and has been for some time. Is being homeless a crime? First, being homeless is not a criminal offence anywhere in Australia. If such a law were passed it would breach multiple long-standing legal principles. It would also breach various domestic and international charters and covenants on citizenship as well as human and civil rights. Despite this, people experiencing homelessness, especially those who are highly visible, socially disruptive or who have complex needs, are frequently subject to systems of regulation and control that drag them into the criminal justice system. For example, begging is outlawed in Victoria by the Summary Offences Act and carries a maximum sentence of 12 months’ imprisonment. While an individual is unlikely to be jailed for begging, they will likely receive a fine. Unsurprisingly, people who engage in begging find it very difficult to pay these fines. When a person accrues enough of them, a warrant can be issued for their arrest. Challenging these fines accounts for the bulk of the work of specialist homeless legal services in Melbourne. Beyond begging being outlawed, many other laws directly or indirectly target people experiencing homelessness. These include laws banning squeegeeing at traffic lights, camping in public space, drinking in public, being drunk and/or disorderly, using offensive language in public, besetting footpaths or entrances and indecent exposure. For people experiencing homelessness, performing actions and behaviours that are necessary for survival frequently places them in breach of these laws. For example, going to the toilet may result in a charge of indecent exposure. Going to sleep may result in a charge of camping in or besetting public space. Do these kinds of laws work? In the past two decades many cities, states and countries have introduced new ways of regulating the homeless, particularly in the UK and US. The use of hostile architecture, for example, appears to be increasing. Such strategies essentially bypass legal frameworks by embedding the “move-on power” into the architecture of public space itself. This leaves homeless people with fewer places to be. And it often renders them increasingly visible and thus more exposed to intervention by municipal officials or police. Some US cities have passed laws banning all kinds of behaviours that the homeless may engage in and enforce these selectively. Some have even banned giving food to the homeless. This has led to police arresting and charging members of local churches and charity groups. In the most egregious examples, some cities round up anyone suspected of being homeless, pack them into buses and dump them in the hinterlands of another municipality. Have these actions reduced rates of homelessness? No. Such laws may decrease the visibility of homelessness in some areas, but bans are ineffective when used against populations that have nowhere else to go. Where does or should responsibility for the homeless lie? Justifying such laws are claims, like Ashton’s and Panahi’s, that these people have been offered accommodation and refused, revealing their homelessness as voluntary. However, interpreting the choice to turn down temporary stop-gaps and band-aids in this way misses something crucial. If a person refuses temporary accommodation in order to demand more stable and supported accommodation, it is because they know such short-term solutions are not solutions at all. Temporary housing simply results in people churning in and out of desperate situations. We must understand housing as being defined by its stability and relative permanence. Offering someone a month or two of accommodation is not the same as offering them housing. Questions of who should take responsibility for the homeless inevitably arise from these situations. The most common answer to these questions are shouts of “Not me!” However, given the criminal justice systems — police, courts and corrections — are publicly funded institutions, choosing to criminalise these behaviours is choosing to take responsibility for those who perform them. Importantly, research has shown that dealing with homelessness through punitive means is actually far more expensive than strategies that supply affordable housing and supported accommodation. So whether we choose to help or punish, we are choosing to take responsibility for and invest resources in this persistent social problem. Why don’t we choose the option that is not only cheaper but kinder as well?